Fossils can be described as the remains or traces of ancient life which has been preserved through natural processes and it can range from tiny shell fish to well preserved skeletons. Other things which could become fossilised include imprints, trails and tracks like those of dinosaur footprints and worm burrows. These are defined as trace fossils. The study of fossils helps us to understand as to how plants and animal thrived millions of years ago. 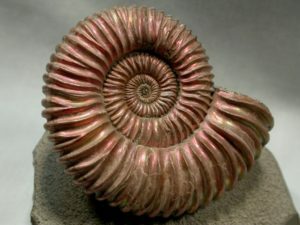 The term fossil comes from the latin word fossillis which literary means ‘obtained through digging’ and is the preserved remains from the past geological ages. Fossils are also found preserved in amber, petrified wood, coal, oil, and hair as well as DNA remnants. Fossil record is the totality of fossils. The study of fossils is called palaeontology and when studying fossils one is able to study their age, evolutionary significance and the way it is formed. Generally something is considered a fossil when they are over 10,000 years old. The oldest can be around 3.48 to 4.1 billion years of age. A geological timescale with fossils of different ages could be identified depending on certain rock strata. With the development of radiometric dating techniques, the scientists of the 20th century were able to quantify and measure the absolute age of rocks along with the fossils they host. Fossilisation could occur through many processes, which includes bioimmuration, permineralization, molds, casts, carbonisation, replacement and recrystallization. The size of fossils can vary from a bacterium which is one micrometer to dinosaurs and other animals and trees which are several meters long weighing several tons. A fossil generally preserves only a part of the deceased organism and is generally the part which was partially mineralised during the lifecycle, such as teeth, bones of a vertebrate and the exoskeletons of invertebrates which are calcareous in nature. Inchofossils or trace fossils are the ones which are left behind by organisms such as trails and tracks which are called chemofossils or biosignatures. The fossilisation of organisms needs unique circumstances to prevent decay without a trace. These conditions are rapid and permanent burial, lack of oxygen which limits scavenging and decay, absence of heat or compression which could destroy fossils and the continued sediment accumulation. Thus, the fossils are mostly preserved within sediments which are deposited in water, wetlands, ocean or river basin.